No matter how long you’ve held your licence, a good understanding of the Highway Code road signs is a vital component of your driving skill set. It’s especially important if you’ve recently passed your driving test, as you won’t yet have direct experience of every different type of road layout. The safer you are, the more you can potentially save on new driver insurance too, so it actually pays to know your road signs. Let’s begin with the basics. Circular road signs: Circular signs give orders - they must be followed to stay within the law. Circles with a red border tell you what you must not do (i.e. take a U-turn). Blue circles usually give a positive instruction, such as ‘turn left ahead’. Triangular road signs: Triangular signs warn. Road signs in the shape of an equilateral triangle are designed to warn you about the road layout or any hazards that lie ahead, such as sharp bends. They almost always have a red border. Rectangular road signs: Rectangular signs inform. Blue rectangular signs give information on motorways, green signs direct you on primary roads, while white signs give directions on minor roads. Rectangular signs can also indicate bus lanes and congestion charge zones. Many road signs, such as speed limits, are self-explanatory, but some aren’t quite so straightforward. We look at a few of the most common traffic signs in more detail – and some that are commonly misunderstood. 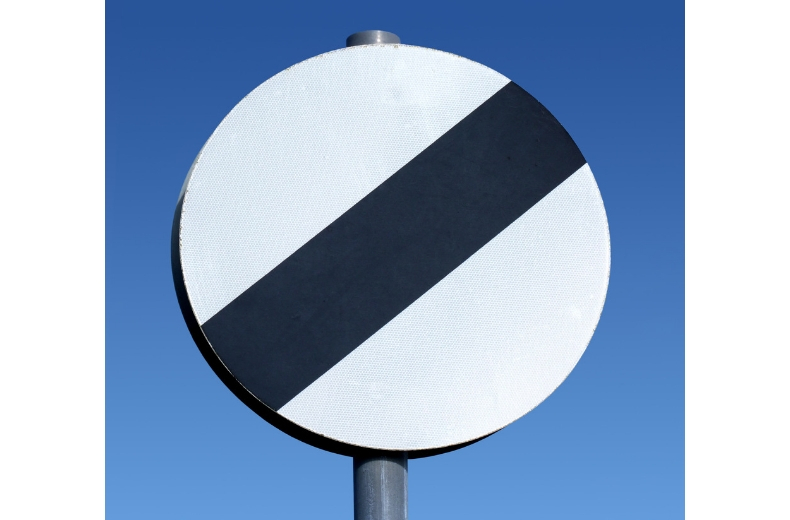 A white circular sign with a single black diagonal stripe through it tells you that the national speed limit applies on the upcoming stretch of road. It supersedes any previous speed limit signs you may have had to adhere to, such as passing through temporary roadworks. But what are the national speed limits? Built-up area: On a road where there are street lamps placed no more than 200 yards apart, the speed limit is 30mph for all vehicles. Single carriageway: For cars and vans, the speed limit is 60mph, or 50mph if you’re towing a trailer or caravan. Dual carriageway and motorway: It’s 70mph for cars and vans, or 60mph if you’re towing a trailer or caravan. Of course, even when the national speed limit applies, it might not always be safe to drive at that speed, so use your common sense on this. 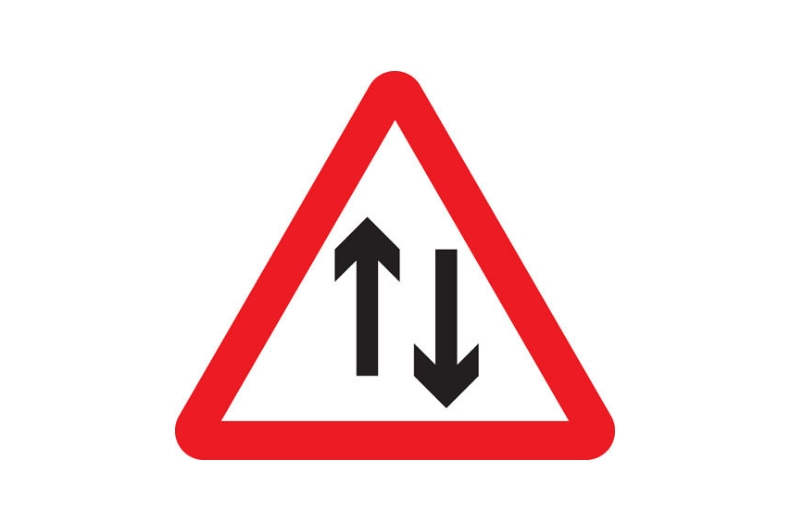 This triangular sign is one of the most frequently seen on UK roads and is used to warn you of a junction ahead. Traffic on the road you will be joining has priority, so you must wait for a safe gap before continuing. 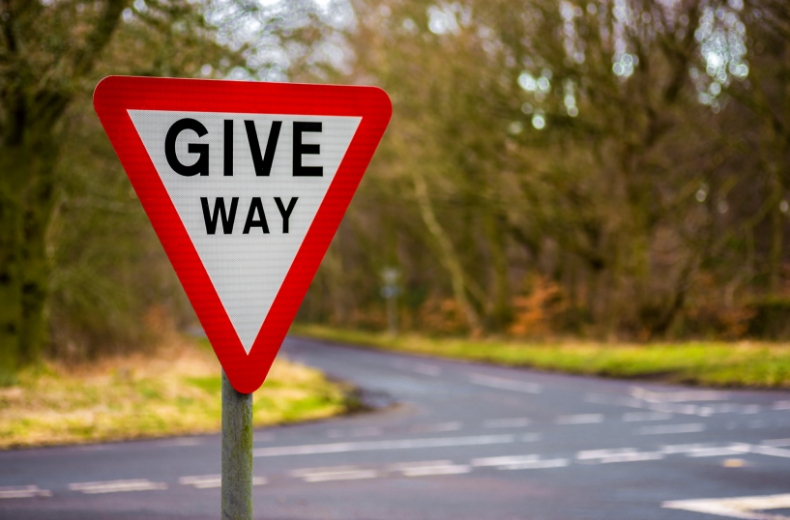 There are two types of Give Way sign – either with distance in yards to the junction under the sign, or with the words written in the middle of the sign. You’ll notice that the triangle is upside down compared with other warning signs. That’s so it can still be recognised if it gets defaced by snow, for example. A red cross over a blue background indicates a clearway, which means you’re not allowed to stop – not even to set down or pick up passengers. In some instances, restrictions may only apply at certain times of the day. You tend to see this sign on major commuter roads, such as Red Routes, or outside schools. This is one of the most commonly misunderstood signs, and many drivers have fallen foul of the law by parking on a clearway. This sign means that you must not drive any motor vehicle down a road where this is displayed. It could be that the area is reserved for pedestrians and cyclists only. 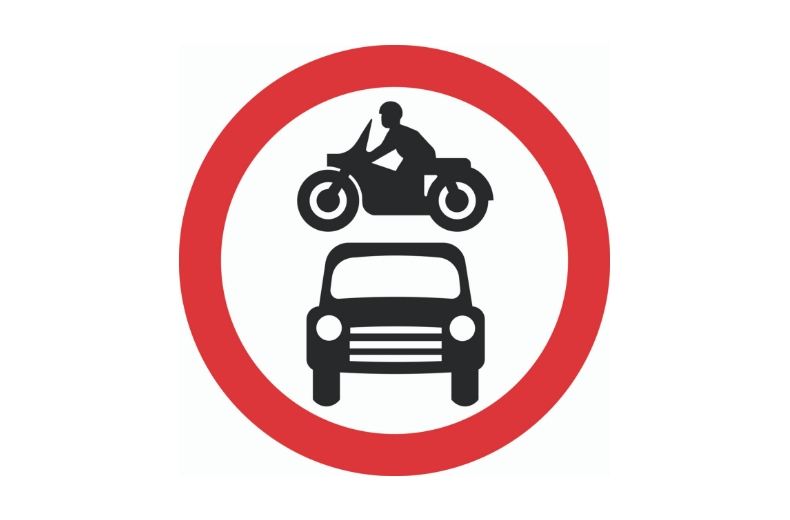 This no motor vehicles sign showing a motorbike over a car is sometimes misunderstood to mean only cars and motorcycles are permitted. Nor does it mean motorcycle stunts aren’t allowed - you can be reasonably confident that they aren’t anyway! 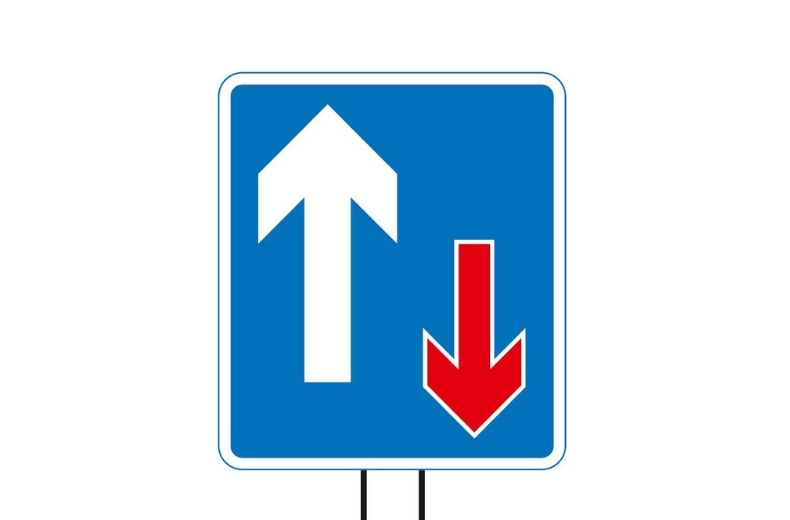 When you see a rectangular blue sign with a large white arrow and small red arrow pointing in opposite directions, it means you have priority over vehicles travelling from the other way. Drivers are often confused by this as it’s not always clear who has right of way. 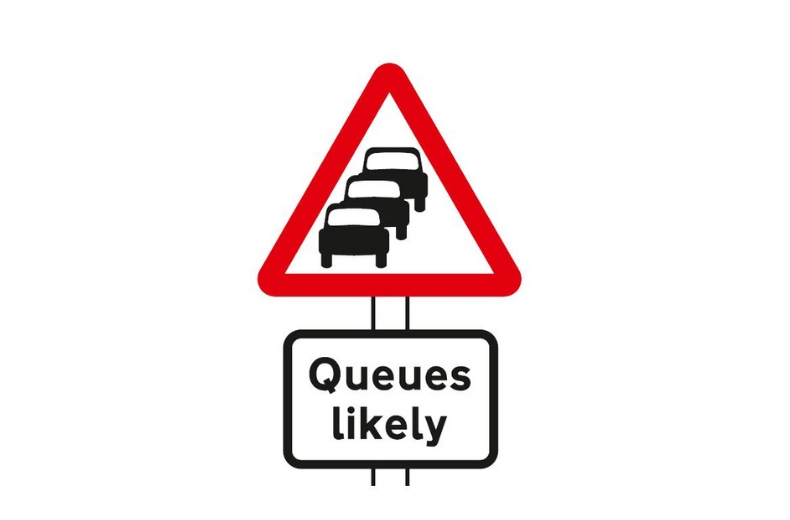 You’ll commonly see this sign when a road or bridge becomes very narrow, or as part of traffic calming measures where there is only room for one vehicle to pass. If there’s another vehicle travelling towards you that is already in the narrow area, wait for it to pass. 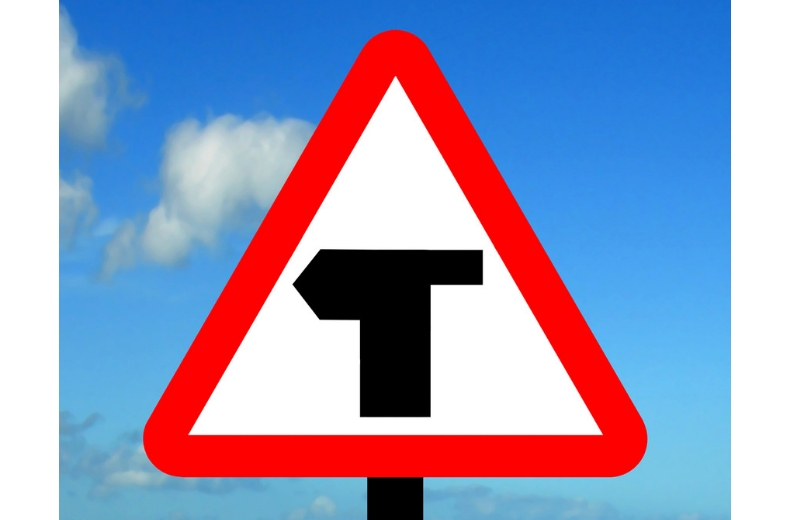 A T-junction is a place where a minor road joins a major one without crossing it, forming the shape of the letter T. The T-junction sign is often placed in busy areas to warn you to be careful as vehicles may be stopping to turn. It can be particularly useful if you’re driving on dark roads at night to let you know you’re approaching a busy junction. 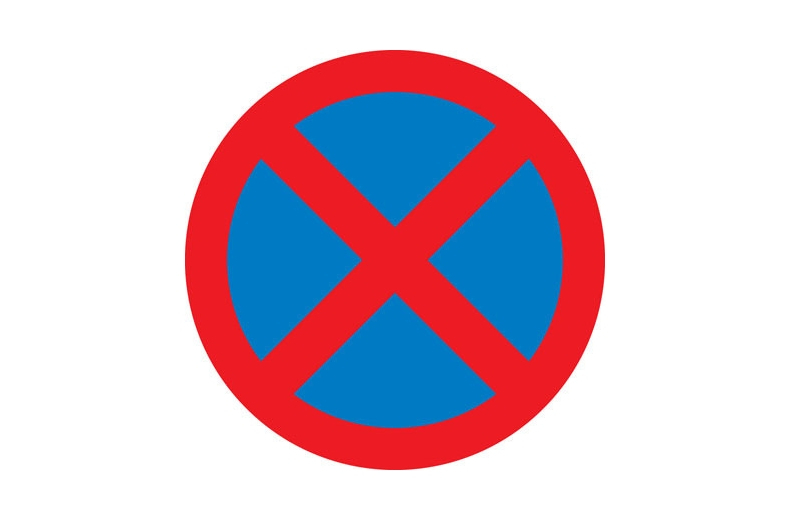 The T-junction sign shouldn’t be confused with the ‘no through road’ sign, which is a blue square with a red and white T shape on it. If you see a triangular sign with a row of cars on it, it’s warning you that you’re approaching a congested area, so be prepared to stop. The queues ahead might be hidden, so make sure you’re aware of vehicles behind you that could be following too closely. If you brake sharply they could run into the back of you so, when you see the sign, start slowing down gradually and brake smoothly. Driving in stop-start traffic could potentially cause your engine to overheat, so it’s always advisable to have breakdown cover just in case. 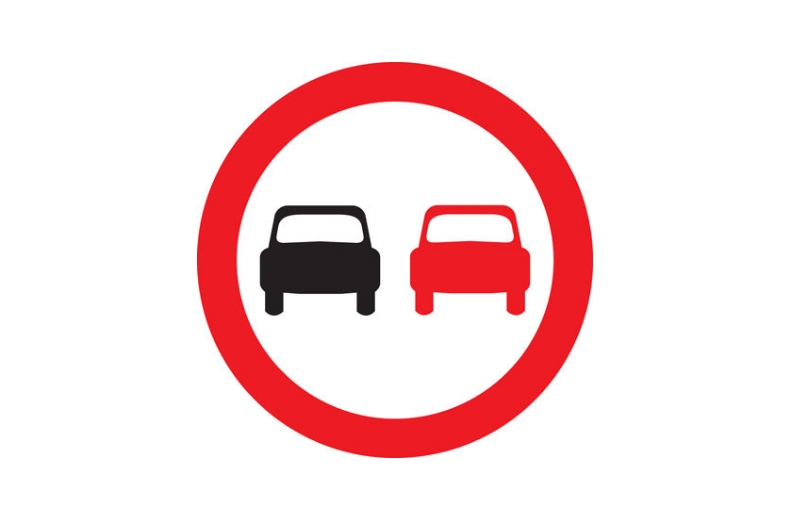 There are several reasons why you might see this sign – it is often displayed when the road has poor visibility or if it’s too narrow for safe overtaking. It also warns you when there’s a high risk of vehicles pulling out from parking spaces or driveways that would increase the risk of a head-on collision. READ NEXT: Advanced Stop Lines – what are they and can I get fined for entering one? Sometimes you’ll see a red triangular sign with two black arrows pointing in opposite directions. These are used to make you aware that you’re about to leave a separated one-way street and enter a two-way road. If the arrows are positioned vertically, it means two-way traffic straight ahead. You should keep to the left-hand side of the road and be aware of oncoming traffic. If they’re horizontal, it indicates that you’ll have to turn either left or right to join the two-way road ahead. Images obtained from the Government’s online guide to traffic signs. Parking lights - what are they and should I use them?